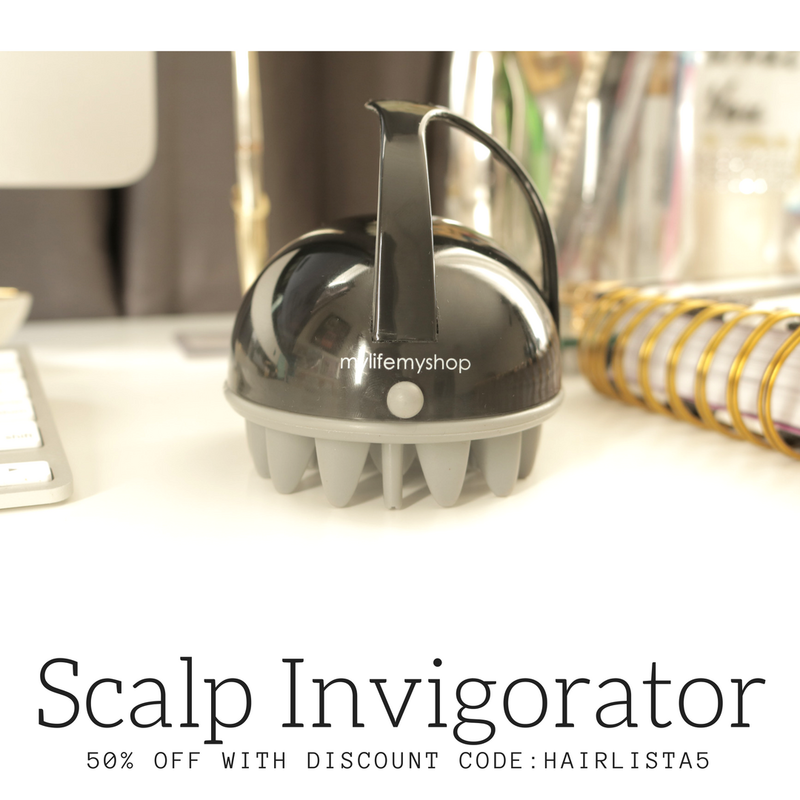 June 2018 - Hairlicious Inc. Protective Styling On Vacation - My Feed In Cornrows! I took a much needed vacation to Punta Cana, Dominican Republic with my immediate and extended family and a couple close friends! Oh, it was fantastic to say the least!! So many memories were created and new experiences were lived. It's easy to say that it's definitely going down as one of the best family trips thus far!! 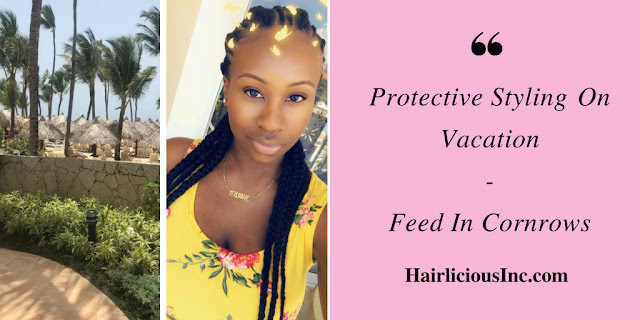 Being 8 weeks post relaxer with thick new growth wouldn't be pleasant to deal with while on vacation - so I got feed in cornrows! I fell in love with this style over the past few months and figured it would be perfect "vacation hair" as I wouldn't have to deal with my hair for 7 days straight. That's HUGE for me because I always rock my own hair while on vacation, so the break is nice. What I love most about this style is that it's so low maintenance! It's always "ready-to-go". Let's be honest, being away from home with an infant and styling your hair daily can be quiet difficult. I didn't want to lug conditioner, combs, moisturizers, gels, styling products etc. into my luggage. Low maintenance yet still cute was my goal. I wanted the luxury of waking up in the morning with freshly done hair to have extra time to put on a little foundation, lip gloss and mascara and tend to my kids. That's it! This style afforded me just that. I picked up 3 packs of Xpression braid hair in colour 1B (natural black); however, my friend only used two packs. I placed the bundles of hair in individual containers with water (about half way full) and added a little Apple Cider Vinegar (4-6 tbsp in each container). 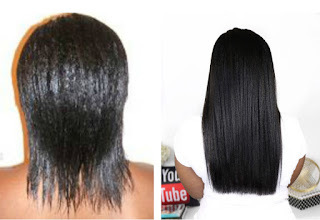 This solution lifts the chemicals on the synthetic hair that typically cause excessive itching. I leave the hair in this solution for a total of 15mins and rinse the hair with cold tap water at least 3-4 times to ensure all the white residue is removed. I then leave the hair to air dry (for 1-2 days) prior to use. 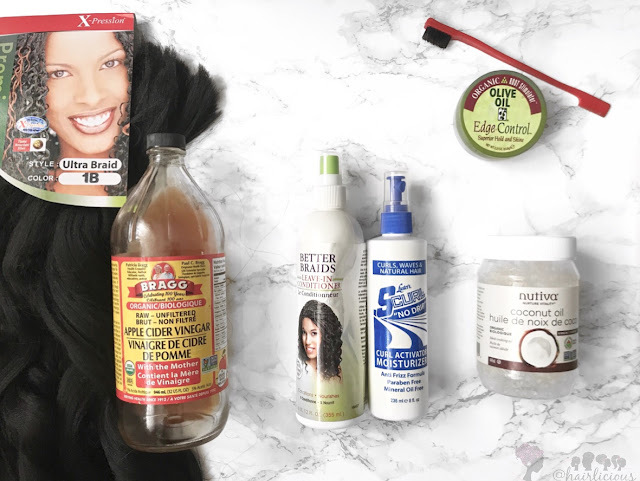 To nourish my hair while in braids, I use the Better Braids Leave-in Conditioner. I got this from the Beauty Supply Store. This spray nourishes and conditions your hair underneath the synthetic braids. It has Hydrolyzed Collagen, Aloe Leaf Juice, Panthenol, Glycerin etc. which help to strengthen and moisturize the hair. It has a fruity coconut scent that's mild for those who may be sensitive and it sprays clear leaving no build up. 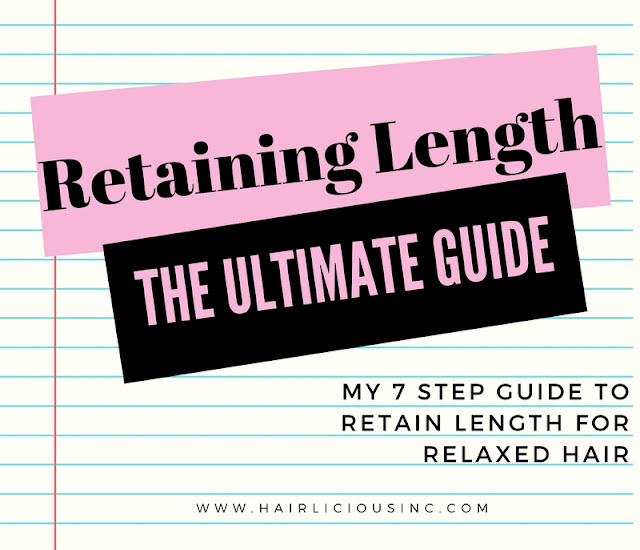 I always ensure to spray the length of my braids (down to where my real hair stops) each day. I spray my braids just before bed with the Better Braids Leave-in Conditioner and tie it with my black satin scarf around the perimeter of my hair line and then cover with my big satin bonnet. 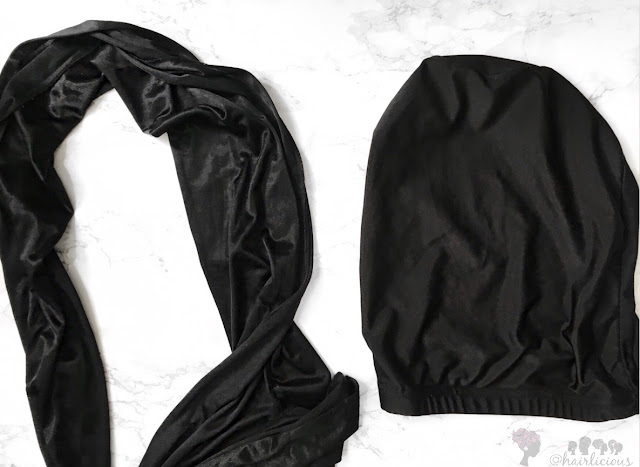 My big satin bonnet is perfect as it has extra room for long hair styles. When I wake up in the morning and remove my scarf, my roots look fresh, flat and moist! If my scalp is itchy, I apply a small amount of Coconut oil directly to my scalp. It works like a charm. If I need extra moisture throughout the day, I spray Scurl all over and down the length of my braids. 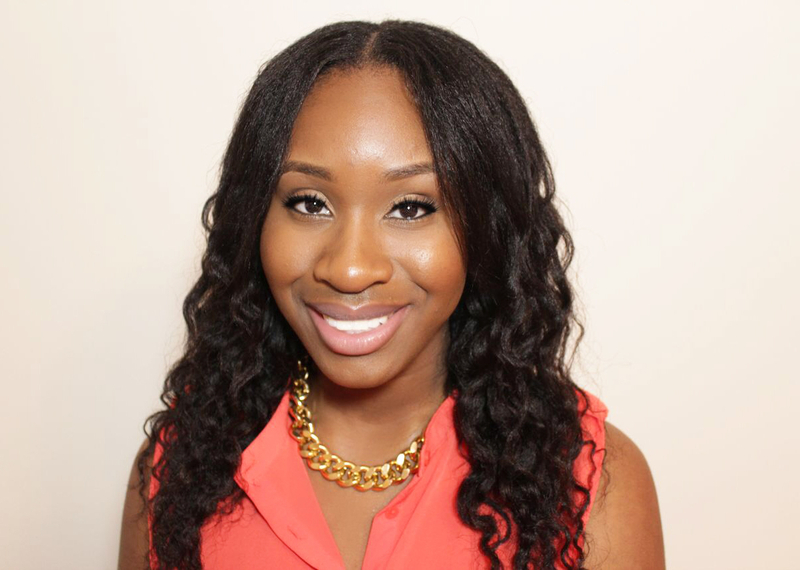 Synthetic hair can make your hair dry and brittle so this extra boost in moisture is crucial. I also pay close attention to my nape and spray it well as that area can be very dry due to friction. 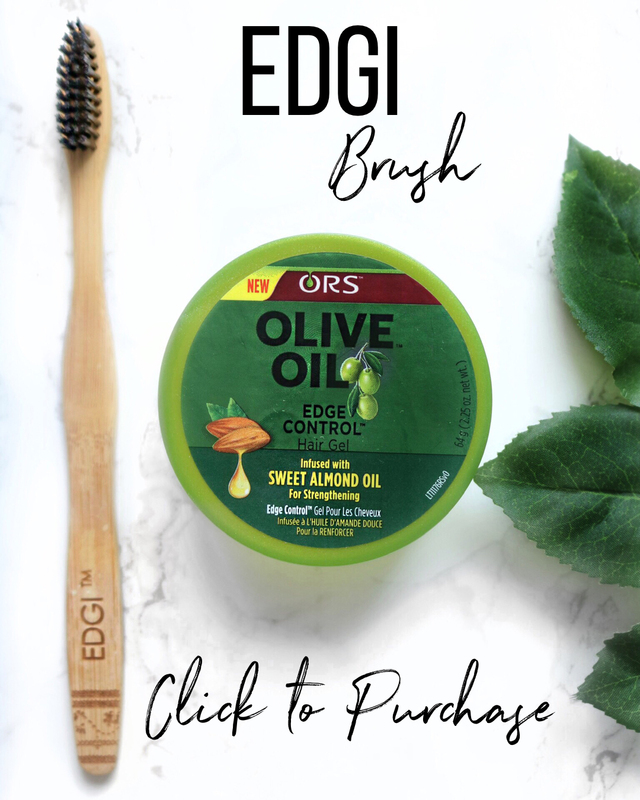 Too, I use my ORS Edge Control to lay down my edges for a sleek look. Done! I opted not to wash and condition my hair while rockin' this style since I'm leaving it in for only 1.5-2 weeks and then its back to my real hair and usual regimen!